What is Humate & Where Does it Come From? Humate is the purest form of natural organic matter known to man and it is one of the most complex substances on earth. Humate is highly concentrated into a solid material, similar to coal. 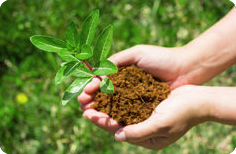 Humate is the generic name for soil humic substances. Humic acid is the chemical properties of humate. Humate and Humic acid are basically one in the same. Humate is essentially to life…for humans, animals and all the plants on this earth. Between 65 to 100 million years ago the Earth enjoyed optimum organic growing conditions. The vegetation was extremely lush and abundant, as is evidenced by ancient remains that geologists call humic deposits. These plants were super rich with nutrients and minerals because of the high oxygen content of the air. These super plants produced the abundant food in massive quantities capable of feeding the dinosaurs for millions of years. These power-packed vegetation crops and massive dinosaurs met their extinction and were covered by ash. Humate is the sum total of this ancient organic matter disassembled by nature’s brilliant decomposition and recycling processes, then highly refined by millions of species of beneficial soil-based microorganisms. Ultimately, microscopic plants such as yeast, algae, mold, fungi, etc., finish up the process. These tiny beneficial plants refine, purify, combine, and re-refine, until tons of once-living matter are converted to pounds and ounces. Yet miraculously, when all is said and done the end product is transformed into the world’s most complex and ultra-compact molecules. Even the nucleic acids (RNA and NDA) of the earlier life-forms remain intact. The molecules are ultra-condensed and highly functional, rolled up into tight little balls that are supercharged biochemical and phytochemical power plants, similar to storage batteries or fuel cells. As the plant and animal matter decomposes, peat is created first, then humate, lignite and, eventually, coal. There are various types of humates depending on geographic location, origin material, and degree of decomposition. The humate from our reserves in Utah are of the virgin, clay family. Our humate reserves are from the vast fresh water seas in the Western USA, and is said to be of superior quality because of the dry, arid desert region and rain did not leach out any of its nutrients and vital Humic acids. The common humate in the US and other world countries are classified as Lignite Leonnodite and being of the coal family by containing some BTU. The virgin clay humate did not reach the 1st stage of coal, thus the definition “virgin clay” because the humate is clay based and loaded with Fulvic and Humic acids and 70% to 90% pure organic minerals. Our reserves are of the very best of humates because is it also impregnated with life supporting mineral nutrients like iron, sulfur, manganese, magnesium, zinc, etc. These nutrients help with human enzyme production, hormones structure and are necessary for the utilization of vitamins. Humate is one of the most powerful natural antioxidants and free radical scavengers. Humate also contains complex energy sources of acids and oxygen, both which are vital for stimulating microbial activity.